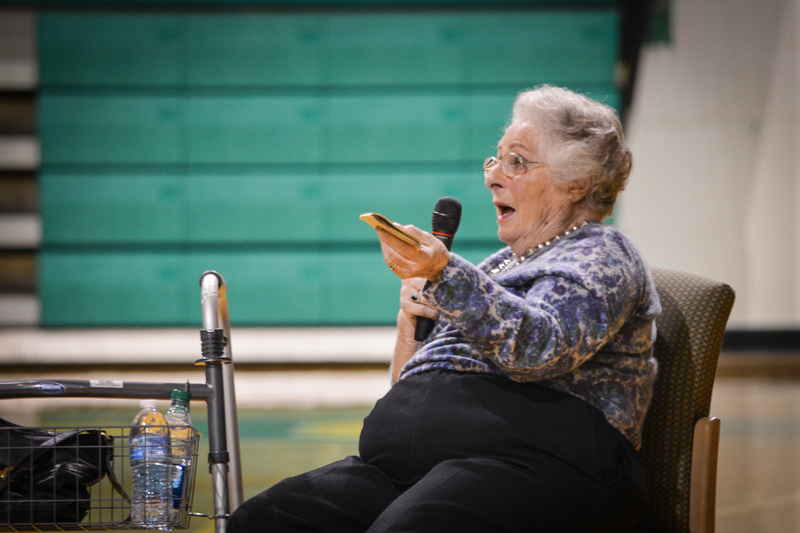 On Wed., Dec. 3, students and faculty at McNicholas High School had the opportunity to learn about World War II and the Holocaust from one who lived through its trials firsthand. Stephanie Marks, 89, shared her story – one that would take her family on a journey of over 7,000 miles, from the war-torn Polish countryside, through Western Europe, and finally to the shores of America, where they would ultimately find refuge. Born in the small city of Konin, Poland, Marks grew up moving between Poland and Belgium, and was only a child when the German bombs began to fall and the Nazi soldiers marched in, forcing her family to flee to Warsaw on horse and wagon, making the dangerous trek through the bombed-out countryside with thousands of their fellow Jews who were seeking refuge. Decades later, Marks still remembers the morning, on the eve of Rosh Hashanah, when German tanks crept over the horizon and soldiers took charge, demanding that the Jews separate themselves from the rest of the group. Though they otherwise would have identified by their religion, the Marks family’s passports did not bear the Jewish stamp, giving them the chance to evade the soldiers, who would leave ten Jewish men dead in the street that morning. Unable to make a safe escape from Poland, her mother gathered her courage and went straight to the Gestapo headquarters, where she told the guard that she had an appointment with Heinrich Himmler, Hitler’s right-hand man and one of the most powerful individuals in the Nazi Party. After talking their way into the office, disguising all traces of their Jewish heritage, young Marks and her mother were introduced to the man they thought to be Himmler, who welcomed them with coffee and cookies, and ultimately secured for them first-class tickets on the next passage out of Poland – a military train with 3,000 German soldiers on board. “For forty years, we though Himmler had saved us,” Marks told the audience of 700. The truth about the situation came to light recently, when a teacher from Northern Kentucky discovered the identity of the officer who masqueraded as the top official and later went on to help create the infamous Łódź Ghetto, the second largest of its kind in Poland. After escaping Poland, Marks and her family ventured westward toward Paris, where they were met with countless challenges, their values having been put to the test at the border, when French officials initially refused their entry into the country, unless the men of the family joined the military effort. Paris, however, was a scene of absolute chaos, and one that Marks and her family left just as quickly as they had arrived. Packing up their belongings once again, they left for Southern France, crossing over the Pyrenees Mountains, where Marks can still recall the terror she felt when the family chauffer stopped the car, telling him that he would kill them all unless they increased his pay. Having no other means by which to pass over the mountains during wartime, they were forced to oblige, eventually making it through Spain via train, and finally through to Portugal, where they waited for a chance to escape to America. After making contact with distant relatives in Cincinnati, Marks and her family left the shores of Portugal on a ship that would carry them away from danger and to America, a land that proved to be foreign, yet hospitable to those fleeing Europe during the war. Even 70 years later, she maintains a close friendship with those she had first befriended in the West End – those who had dared to accept the girl who had come to school speaking four languages, English not being one of them. When Marks, who has since volunteered her time at the local Holocaust Center, reflects back on the Holocaust and on the loss of over 11 million lives, she does so not with hatred, but with a sense of hope that today’s society is headed in the right direction. 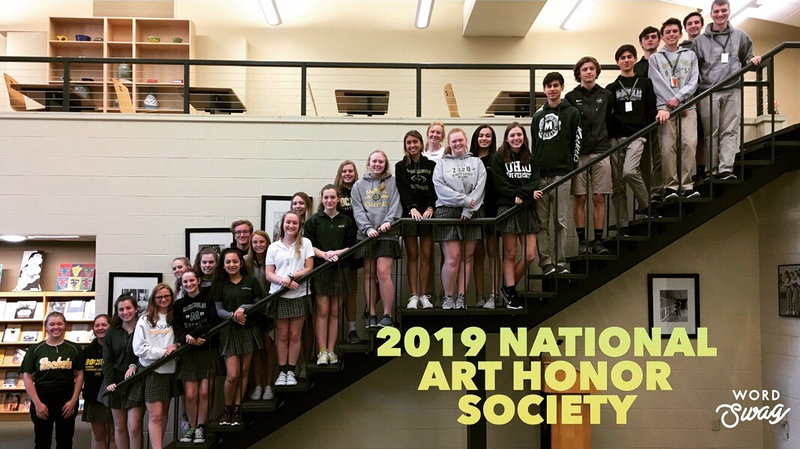 In ending her talk, Marks expressed this love and gratitude to the McNicholas community, receiving a standing ovation from teachers and students.